Before I start, I would like to ask the international news media to stop using the situation in Japan, bloating the facts and making it into entertainment to sell more papers and commercials. Many foreigners who live in Japan and can’t speak Japanese are guided solely on these kinds of news which are made thousands of kilometers out of here, and sadly, much of that information is erroneous, misleading, and/or out of proportions, and has brought panic to them. I have been receiving many messages on my inbox asking me why I haven’t left the country, why I haven’t fled Tokyo to a safer place, why I haven’t gone far far away. This is the reason why I have opted to talk on the mediums on my own behalf and to tweet what has been really happening in Japan day to day, so that people can listen to the voice of people who live here, without any filters of interests. ¿Why won’t you evacuate? There’s so much radiation! Why haven’t you fled Japan? To experience an earthquake, and then to see all the information about the tsunami, fires, and now nuclear plants in Fukushima going on fire, one could panic. Even the Chilean government, in conjunction with the Colombian government, have offered an evacuation flight to Chile. Hmmm, if it is a round trip one, maybe I will take it an visit my family for a week and come back. These mere actions of offering a flight out of the country, which many of the embassies are offering, has caused the international community in Japan to panic. Analyzing all the information and to see it objectively, I think that there is no need for me to evacuate Yokohama, where I live, or Tokyo (where my office is), which are both more than 220km afar from the nuclear plants. When you talk about a the dangers of radiation from a nuclear plant, the most important thing is to know how dangerous is this radiation to human beings. Many news media seems to skip this information. When you hear the information about the nuclear plants, and the radio toxicity, two terms are being used, and both point at the same thing but seem to confuse the viewer and reader. Some news agencies use the smaller one to make things look bigger, but it is easier to talk in milliseverts. After seeing this and then checking the radiation level in in Tokyo and in Yokohama(The highest was of 0.05mSv in Tokyo March 17th). And even if what we really want to evade, which would be a total meltdown of the nuclear plants, the worst that would happen is that a radius between 30km to 80km would be contaminated with this radiation. I am no specialist so if you want to know more in detail about radioactivity in Japan right now, I advice you to read the report and seminar of Mr. John Beddington who gave a speech in the embassy of England in Tokyo. Everybody is using masks in Japan. Is it due to the radiation? ABSOLUTELY NOT.In Japan we always use these type of masks for 3 main reasons. 1. Many people use it to avoid pollen, because they are allergic to it. It’s almost spring in Japan now. 2. Many wear it for respect to others. If a person has a cold or a similar sickness in Japan, you wear this mask so he/she won’t give this sickness to someone else. This shows a little about the Japanese spirit, where people care about how they influence other people even when they are sick. 3. 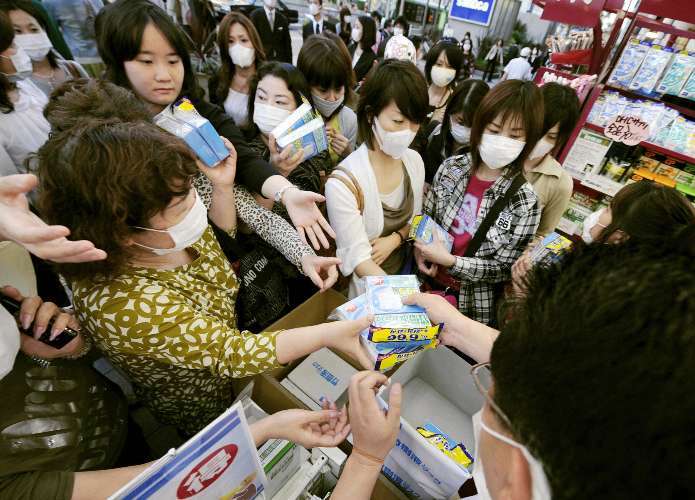 There are other problems in Japan like the bird flu, which many are afraid of. Also, if this was because of radiation, these masks won’t do you any good. What the government is asking to the people near the 30km radius of the nuclear plants is to put a wet towel on their mouth and nose if they need to go out of their house (among other things). What was your experience with the earthquake? We were in our office of Nikkei Youth Network on the 6th floor in Shibuya, Tokyo. Around 3pm, we felt as if our building was being hit and pushed by someone. With my colleague Mao, we ran down the stairs and to the Aoyama Gakuin University, which is right besides our building, because they have an open air place as a refuge in cases like these. From there, we could see how the skyscrapers would move as if they were made out of soft plastic, and hear the windows give these scary noises as if they would brake at any moment. After 15min, we went back to the office but, had to come running down again 5 times since aftershocks kept coming. Here’s a video of what I took when we left our building. Notice the green building at the ends of the video. I tried to call my wife and 10 month old son but none of the telephone lines worked. That was what worried me the most because I knew they were out of the house in a playground for babies. Finally at 8pm we got to a hold of each other through Skype. Internet was the only communication medium that was still working. So then I got calm, we had not heard of the terrible news in the north yet. While, I was waiting and watching the news on ustream, I started receiving many messages on my Facebook and Skype from the Chilean newspapers and television (there are very few Chileans in Japan, only 600). They were trying to contact me to see how were all the other Chileans in Japan, and since I am the owner of a group called Chileans in Japan on Facebook, they decided to contact me. to the left, people gathering in park after the quake, to the right is one of many people who took out their emergency capes just in case. How did you manage to go back home on the day of the earthquake? I wanted to go to my house but the trains had stopped. I used Google maps to see how much time it would take me to walk to my house in Yokohama, and it was about 23km, so it would be a 5 to 6 hour walk, with many people possibly in panic in the streets… I decided to wait, as the Japanese government asked their nationals who were out of their houses. Luckily my train line started working again around 11:30pm so I was able to take it around that time. I was able to give my wife and sleeping son a long and nice hug around 2am. Is there a food shortage in supermarkets? Because of fear that food would be gone, many people went on and bought many things in the supermarket leaving the supermarkets with a shortage of bread mineral water (tap water is safe to drink), candles, batteries, milk, diapers, and toilet paper. Today on March 17th, there’s still a shortage but if you look in big supermarkets, you may find what you look for here in Tokyo and in Yokohama, and it is not as if we are dying to death so please don’t worry. In the north of Japan, the situation is really bad because there are many places where it’s hard to get to with roads that were totally destroyed and to top that, it is snowing as well. Here are some of the photos of the first days in the convenience stores. Why is there no looting in Japan? Why is everybody so calm although the country is in crisis? This is a question that I see many foreign journalists write about, and to my surprise have never been in Japan even once, but still give it a shot in answering but have failed in describing it (some examples: BBC Magazine, Washington Times). I am Nikkei, a Japanese descendant, a Haft (or half Japanese as they say), raised with a Japanese father and lived in Japan for more than 6 years, and here is what I would like to say about this (But correct me if I am wrong). First of all, Japan had a bigger catastrophe called World War II. This was a human disaster and not a natural one. Two atomic bombs who killed more than 200,000 people, the Tokyo bombings who killed 120,000 people (and destroyed my grandfather’s house as well) and many planned attacks by the United States. Normal people were attacked and many had no where to hide, had to live in darkness for years, and work very hard to rebuild their country. 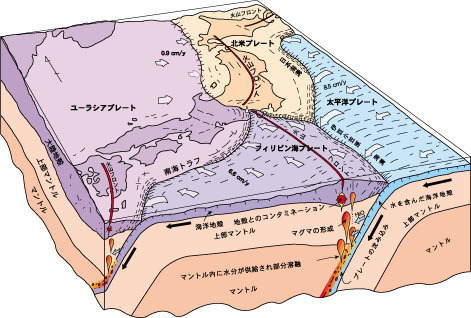 Adding to that experience, it is a country that’s sitting in the middle of 4 tectonic plates, which makes it a very seismic region. The famous Mount Fuji, Japan’s most beautiful and tallest mountain is located in the meeting point of the three plates. This is a beautiful mountain, but at the same time it is a volcano, so if it erupts, Shizuoka, Kanagawa and Tokyo would all be gulped by lava or volcanic ash. That is why (we) the Japanese have it in their heads that a BIG ONE could come any minute. When the earthquake came on March 11th, many of us said the same thing “Ah, here’s the big quake we were taught was coming years ago”. In all schools and in the majority of companies, they have annual (or semestral) evacuation drills, where I have been part of as well. You practice these drills and try to perfect them, timing each time that we do it, and see if we have made a new record. These are things that prepare the Japanese for earthquakes, on a practical point. Then comes the cultural and educational factor. This is a country with more than 120million people who live in a small island (it is 11 times more dense than in the USA). If there wasn’t this kind of good conduct, it would be complicated to live here. Sometimes Japanese are criticized for being shy and not expressing what they feel, or that they don’t react as quickly as demanded when taking decisions. I think it has to do a lot with the word “Wa” or “和”in Japanese, which means harmony. This harmony is very important in Japan and is helping maintain order in the north right now. I use this example to show how Japanese people think. It is more centered in “the other” or the group, it is truly thinking about the other person and not imposing your own ideals to them. This culture of empathy is the real secret ingredient to maintaining calm in such a situation. These are very hard times for Japan and the people who live here. To know that there are more than 8000 people who have lost their lives, and another 10,000 which are still missing , is heartbreaking. I see the news and try to ignore the individual interviews that they make to people who have lost or are missing their loved ones. Sometimes I unwillingly start imagining myself in their shoes, and thinking that it could’ve been me. That has made me sleepless for a few days. But in these moments of sadness and despair, I have found power that children have. On Sunday-two days after the earthquake-we went to a park nearby with my wife and son to “breathe some fresh air” and try to forget for a little bit what was happening. While we were walking to this park, my 10 month old son, would smile or try to talk (in baby language) to the people near by. Everyone who had a sad or serious face, changed into a smile and sometimes a laugh. My son is doing this to me too. He makes me smile and laugh. He has shown me that you have to smile and think positive. That the worst has already happened and that now I have to give all that I have to help this country to recuperate. This country is part mine too, a country that has kept us safe and calm even in these moments of crisis. Thank you my son for making your father and mother think positively again. Here I leave you with a photo of my son in the park I told you about, to remind you that we have to keep on smiling, and think in constructive things. Things that will help change this situation in something better and not to worsen it. Thank you for reading all the way, and if you want to leave a comment, good or bad, please do so below this. Pingback: Becka.nu » Strålning i Japan? Thank you very much for sharing. These days what is most urgent is to focus on the news of salvation – found first in physical family and ultimately spiritual family. Kamino shyukuhuku o oinorishimasu (my attempt at “God bless you!” Thank you again for the effort you put in to writing this.